1. Does your book club need a place to meet? Reserve the Gentry meeting room at the library. 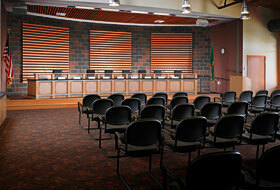 Visit the reserve a meeting room page to make an online reservation. If you'd rather meet elsewhere locally, consider local restaurants, coffee houses, co-ops, and churches. 2. Do you need helping finding materials? If you're looking for book reviews, author biographies, or other resources concerning your book, we're here to help. Just ask at the front desk, or complete the ask a librarian form. 3. Would you like a guest speaker at your book club? Our staff members have plenty of knowledge and enthusiasm to share. 4. Would you like a workshop about starting or leading book groups? Let us know. Complete the ask a librarian form and type in "book group help" as your subject. If we get 10 or more participants, we'll schedule an afternoon workshop. 5. Is your book group in a quandary? Ask us for a consultation. Together we can come up with some ideas to get things running smoothly. 6. Want to know what to read next? Give us a list of books your group has enjoyed (and not enjoyed) in the past, and we'll give you a list of suggested titles. 7. Need extra copies of a book? Use our interlibrary loan service to borrow your upcoming book club title from libraries in our region. Ask for more information at the front desk. Be sure and request the book 7-10 days before you want to start reading. 1. Can the city attorney's office provide legal advice to private citizens? No, the city attorney's client is the City of Burlington. The city attorney is prohibited from providing legal advice to private citizens. 2. What is the function of Burlington's Prosecuting Attorney? The Burlington Prosecuting Attorney handles only the prosecution of criminal misdemeanors, gross misdemeanors, and infractions committed within the city limits of Burlington. The Skagit County Prosecutors Office contains both civil and criminal functions and handles the prosecution of felony cases, misdemeanors that occur outside the city limits of Burlington and all juvenile cases. 3. Where can I get a copy of a city ordinance or resolution? Copies of all City ordinances or resolutions are available upon request at the Finance Department or the city attorney's office. This site also carries the Burlington Municipal Code which contains codified ordinances. You can also find a copy of the municipal code in the Burlington Public Library. 4. How do I report a claim against the city? Claim for Damages forms are available in Finance Department at city hall, or you may use the Claim for Damages form provided on this website. Fill in all pertinent information and return it to Finance Department with any substantiating documents, including but not limited to: damage estimates, photographs, incident reports, medical bills, etc. Please make necessary copies prior to submittal. The information will be immediately forwarded to the city's insurance authority pool (Washington Cities Insurance Authority). They will proceed with an investigation of the claim and respond to claimant directly regardless of whether the claim has been accepted or will be denied. The information will be immediately forwarded to the city's insurance authority pool (Washington Cities Insurance Authority). They will proceed with an investigation of the claim and respond to claimant directly regardless of whether the claim has been accepted or will be denied. Again, this is strictly for insurance items that are submitted for claims not tortious claims. Those claims must be filed with the finance director. 6. What is the difference between the city attorney and the county prosecuting attorney? The city attorney is the attorney for the City of Burlington. The city attorney provides legal services to the mayor, City Council, finance director, as well as for city departments, boards, commissions and offices of the City of Burlington. The Office also prosecutes violations of the Burlington City Code, but not any violations of state law. The County Prosecuting Attorney is an elected official who investigates and prosecutes criminal activity (other than violations of the Burlington City Code) throughout Skagit County. Find out more about the prosecuting attorney's office to get a better understanding of what the prosecuting attorney is responsible for. 1. What is unlawful Harassment? A knowing and willful course of conduct directed at you which seriously alarms you, annoys you, or harasses you, and serves no legitimate or lawful purpose; would cause a reasonable person to suffer substantial emotional distress, and actually causes substantial emotional distress to you. 2. What is a course of conduct? A series of acts over a period of time, however short, with an on-going purpose. 3. How does the court determine if the acts are legitimate or lawful? Is the respondent, the person who is harassing you, contacting you or are you contacting each other? Has the respondent been clearly told that you do not want any further contact? Is the respondent's behavior alarming, annoying, or harassing you? Are the respondent's actions interfering with your privacy or creating an intimidating, hostile, or offensive living environment for you? Has the respondent's contact with you been previously limited by a court order? 4. What is an Order for Antiharassment? An Antiharassment Order is a special type of restraining order which is available only to victims of harassment. It is a civil order of the court telling the person who harassed you not to bother you again. The police are notified of your Antiharassment Order. The order is fully enforceable in any county in the state. 5. Do I need a lawyer to get an Order for Antiharassment? No, the law has been designed so you can get an Order for Antiharassment without a lawyer by filling out the forms yourself. You are seeking an order of the court without the help of an attorney, you will have the paperwork and legwork to do. It is not unusual for this to take several hours. 6. How do I obtain an Order for Antiharassment? You can get the forms free at Skagit County District Court. Fill out the forms as completely as possible giving the court written information about what has happened and why you need the court order. The clerk is not allowed to give legal advice. If you need legal advice, please contact an attorney. Take your completed form to the clerk who will explain how to file them. A hearing date will be set before a judge or court commissioner. This hearing will be within two weeks. The respondent must be served with the papers you have filed and with the notice of the hearing. Service is very important and must occur before you can get your one-year Antiharassment Order. The court can order law enforcement to serve the respondent with these papers. At the Antiharassment Order hearing, the court will decide whether to sign your order and may make some changes. The Order for Antiharassment will generally last for a maximum of one year or maybe longer if necessary. If you are in immediate danger, you may obtain a "Temporary Order for Antiharassment" prior to your full hearing in two weeks. Ask for and fill out the forms for a Temporary Antiharassment Order. You will see the judge or court commissioner the same day you file your papers and may need to explain why you need immediate protection, if you have filed the paperwork at a reasonable time. You should not expect to see a judge if you wait until the end of the day to file your paperwork. You must show reasonable proof of unlawful harassment by the respondent and that great or irreparable harm will be the result if the Temporary Antiharassment Protection Order is not granted. The Judge can grant you a Temporary Order which will be served on the respondent, along with the notice of the hearing for the one year Antiharassment Order. The Temporary Order will expire on the date of the hearing for the one year Antiharassment Order. You must attend the full hearing to extend your Temporary Order for Antiharassment. The filing fee is $53.00. The courts will charge an additional $5.00 fee for copies and certification charges for the first page and charges for each additional page. Take a look at the Clerk Fee Schedule. There may also be a charge for having copies delivered to (served on) the respondent. If you cannot afford the fees, the court may allow you to go ahead without paying. Ask for and complete the form requesting a fee waiver. 8. What if I have previously filed for an Antiharassment Order against the respondent? You may not obtain a temporary Order for Antiharassment if you have already had two temporary orders against the respondent and not obtained the one-year order, unless you can show the court good cause for failing to get the one-year order. If you need to renew your one-year order, you may reapply by filing a new petition within three months before the expiration of your order. 9. What happens if the Antiharassment Order is violated? Any willful disobedience of the Antiharassment Order by the respondent shall subject the respondent to criminal penalties and the respondent may also be found in contempt of court. 1. How do I get a Burlington Public Library card? View the Get a Library Card page. 2. How do I renew library materials from home? View more information about the City Attorney's Office. 2. How do I contact the Burlington City Hall? View contact information for the Burlington City Hall. 3. How do I find a street in Burlington? Download the 2013 Street map and Index Sheet. 4. How do I get a city business license? View more information about business licenses, which are can be obtained through the Finance Department. 5. How do I get a passport from the Burlington Municipal Court? View more information about obtaining a passport. 6. How do I get to Burlington? Burlington is located at the intersection of I-5 and State Highway 20, 65 miles north of Seattle and 45 miles south of the Blaine border crossing. Driving from the east or west State Highway 20 will take you into the business district of Burlington. From I-5 you may take exit 231, 230 or 229. View information about public transportation. 7. How do I get to the Burlington City Hall? Download directions to the Burlington City Hall. 8. How do I know what Council Ward I am in and which City Council member represents me? Why new wards? Download the City Council Ward Map. 9. How do I find lodging in Burlington? 10. How do I file a citizen complaint? Complete the online citizen complaint form. 11. How do I report a claim against the city? Complete the claim for damages form. 12. How do I file an incident form? 13. How do I file a public records request? View the Public Records Request page. 14. How do I schedule a public meeting room? You can learn how to apply for a passport on our passports page. 2. How do I find out my court date? 3. Where is the Burlington Municipal Court house? The Burlington Municipal Court is located at 311 Cedar St. along with the Police Department. It is located between Burlington Boulevard and Spruce Street on the north side of Fred Meyer, across from the roller skating rink. 4. What do I do if I get a traffic infraction ticket? View the requirements on the infraction procedure page. 5. Can I make payments on a traffic infraction ticket? If you are unable to pay your entire penalty at the time of the hearing, the judge or the clerk will work out a time payment agreement. This is a contract with the court for installment payments, which you must follow. Read the contract carefully and completely. Failure to follow the contract can result in late fees, possible suspension of your driver's license and assignment to a collection agency. There will be a $10 charge for infraction time pay agreements. 6. Can I come to the court to view the procedures on a court day? Anyone who is interested may attend our court hearings on the first, third, and fourth Wednesdays of the month. Hearings are held from 8:30 a.m. with the last proceeding starting at 3:30 p.m. The most active hearings to watch would be the 9:30 a.m. or the 2:30 p.m. hearings. These hearings can be very interesting and educational to those unfamiliar with court proceedings. 7. How do I make an online payment? 1. Why does the Burlington Public Library charge a fee for non-resident library cards? Residents and property owners of the City of Burlington support the Burlington Public Library via their taxes. The non-resident fee offsets the cost to serve non-residents. 2. My address is Burlington, so why am I a non-resident? You may have a Burlington postal address but if your property is physically located in the unincorporated areas outside Burlington city limits, by definition you are a non-resident. 3. What difference does where I physically reside make? Where you physically reside determines who provides services to you. 4. Do any other libraries charge non-resident fees? 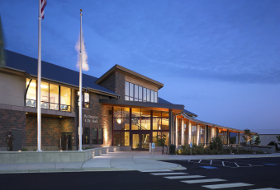 Yes, each of the public libraries in Skagit County charge non-resident fees. 5. How are non-resident fees assessed? A library card is the best bargain around at less than 17 cents a day. 6. What do I get when I purchase a non-resident card? A non-resident card entitles you to the same privileges as a resident library cardholder. You can check out library materials (books, videos, magazines, audiobooks). You have access to the Library's 37,000-item collection and 100+ magazine and newspaper subscriptions. You can use the Library's electronic resources, including the internet, Microsoft Office software, and online magazine databases. Children can attend library storytimes, events, and participate in the summer reading program. 7. Is there a charge for attending library programs or using library resources and materials in the library? There is no charge to use library materials in the library for studying in the library, for using our public computers, or for asking reference questions. In addition, fees are never charged for library programs, including storytimes, and teen and adult workshops and informational programs. 8. 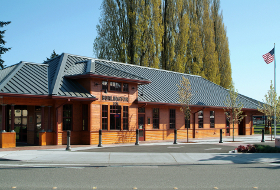 When will Skagit County get its own library system so we won't have to pay non-resident fees? Good question. Concerned citizens have brought this issue to the public for a vote several times in the past 10 years. We agree that it would be a great benefit to be able to offer all Skagit County residents library cards without charging fees out-of-pocket. We hate turning away families with large stacks of books who will not or cannot pay a non-resident fee. We'd love it if teachers could confidently tell their students to go to the nearest public library and check out a book on their topic without distinguishing if their families live within city limits or not. We envision a system where library cardholders could check out materials from any one of the public libraries in Skagit County—via a shared catalog and circulation system. You'd have access to way more items than can fit in the Burlington Library—for far less than it would cost to buy non-resident cards at each library. Remember, the establishment of library services for residents of unincorporated Skagit County is the responsibility of county residents and county commissioners, not city residents or the City of Burlington. 1. How do I set up an account to register online for Burlington Parks & Recreation programs? 2. How do I find the Parks and Recreation business office? The business office for Burlington's Parks and Recreation Department is located in the "old" City Hall building at 900 E. Fairhaven Avenue between Holly and Regent Streets. Entrance is situated at the east end of the building closest to Regent Street. 3. How do I rent a room at Burlington's Community Center? You may find general information regarding rentals at Burlington's Community Center online. You're also welcome to phone us at 360-755-9649, visit the Parks and Recreation office, or email us. We'll be happy to check availability and answer any of your questions. 4. How do I reserve Skagit River Park's playfields? 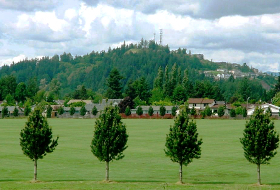 Visit the Skagit River Park Playfields webpage by clicking the link below for information regarding the steps involved with reserving a playfield. Feel free to contact the Parks & Recreation office with enquiry: email parks and recreation, or call 360-755-9649. 5. How do I rent a covered picnic shelter? 6. How do I find information on Burlington's Pea Patch Community Garden? The community garden is located just north of the Skagit River Park's Whitmarsh Road entrance. It is next door to the Whitmarsh Horseshoe Pit Covered Picnic Shelter at 1720 Whitmarsh Road. Go to our Pea Patch Community Garden page for general information and application form in both English and Spanish. 7. How do I enroll my child in little league? Burlington's little league is managed by Burlington-Edison Little League (BELL). Visit their website for league and registration information. Call BELL at 360-755-1743 for rain-out information. BELL typically updates rain-out information by 3:30 p.m. daily. 8. How do I enroll my child in youth football or cheerleading in Burlington? 9. How do I enroll my child in Burlington's youth soccer program? Burlington's youth soccer program is managed by Burlington-Edison Youth Soccer Club (BEYSC). You may email them or visit their website for more information. An additional resource for community sporting and recreational contacts can be found on the Be Active Skagit County website. 10. How do I apply to host a special event in Burlington's city limits? 3. The event is on private property, but cannot be self-contained (i.e. parking spills over onto City owned public property) and/or requires the use of City services, and/or closure of City streets. Submit the following application to the City at least (60) days in advance of your event date. 11. May I advertise on the City of Burlington's readerboard? 12. How do I find the Burlington Community Center? It is also home to Burlington's Senior Center. Driving directions are available. 13. How do I contact Burlington's Parks and Recreation Department? 14. How do I find information on Skagit County's Meals on Wheels program? 15. How do I contact the Burlington Senior Center? The Senior Center is located along Greenleaf Avenue between S. Regent and S. Skagit Streets. They are open Monday-Friday, 8:00AM - 4:00PM. 1. How do I obtain police reports? 2. How do I license my dog with the city? 3. How do I register my bicycle with the city? 4. When are fingerprinting services provided? 5. Is it legal to discharge fireworks in the City of Burlington? In 2004, the City Council passed an ordinance prohibiting the sale, use or possession of fireworks within the city limits of Burlington. Any public display of fireworks will require a permit and payment for that permit. The application for such a permit shall be made to the fire chief and must also have the approval of the police chief. If you have any other questions, you can contact the Burlington Police Department at 360-755-0921, Monday thru Friday, 8:30 A.M. to 4:30 P.M.
1. How do I find out how much traffic uses a particular section of road in Burlington? 2. How do I get City of Burlington topo, street, zoning, and sewer and storm service maps, or an aerial photo? The Burlington Public Works and Engineering Department generates all of these maps for public use. There is a cost for most copies of these maps according to size of print. View the city street map and index spreadsheet. 3. How do I find out where the Burlington sewer and storm system are located in my neighborhood or if I can connect my new home or business to their system? The Burlington Public Works and Engineering Department can help you with this information. They have copies of plans (as-builts) of previously constructed buildings showing where the utilities connected to the Burlington utility system. You can request this information by visiting their office, faxing a request to 360-755-0783, or by calling 360-755-9715. The cost of copies of as-builts is $4 a sheet. 4. How do I find out the elevation of my property? The Burlington Public Works and Engineering Department has in their archives records of monuments in various areas of the city showing the elevations. You can request this information by visiting their office, faxing a request to 360-755-0783, or by calling 360-755-9715. There is no cost for this information. 1. Are the storm drain and sewer drains connected? No, the storm drain and sewer drains are not connected. The city has a separated system. Stormwater is conveyed directly to Gages Slough and the Skagit River, without treatment. Sanitary sewage is collected and treated at the City of Burlington Wastewater Treatment Plant and then discharged into the Skagit River. 2. How much wastewater does the city treat every day? The city treats approximately 1,500,000 gallons of wastewater per day. 3. If I have a plugged sewer can the city help me? Yes, we can check the city-owned sewer main and help locate the problem before you call a plumber. 4. What if the power goes out? The wastewater plant and key pump stations have auxiliary generators to keep them running in the event of a power outage. Sewer service will not be interrupted. 5. How many people work for the Sewer Department? Nine people work for the Sewer Department. This includes the department supervisor, four operators, laboratory specialist, lead operator, maintenance mechanic, and pretreatment coordinator. 6. How much did the treatment plant cost to build? The last upgrade and expansion cost approximately $13 million. This project added to the existing plant which was built in 1974 for approximately $4.5 million. 7. Can the public tour the wastewater treatment plant? Yes, the public can tour the wastewater treatment plant and we'd be happy to have you visit, call 360-757-4085 to schedule a tour. 3. Will a traffic infraction appear on my driving record? When you pay the penalty, mitigate, or if the judge finds you have committed a traffic infraction at a contested hearing, the state law requires that the infraction be reported to the Department of Licensing. The infraction will then appear on your driving record. Neither the court clerk nor the judge has the authority to keep the infraction off of your record. 4. What if I don't respond, pay my ticket, or appear for a hearing? A failure to pay or respond to the ticket within 15 days results in an order that the infraction was committed. If you asked for a hearing and do not appear, your payment is due immediately. When an infraction is not paid in a timely manner or a hearing is missed, a $52 state assessed penalty is added to the amount shown on the ticket. Your license may then be suspended if the penalty is not paid immediately, and the account may be assigned to a collection agency. The court does not issue warrants for failure to pay fine. 5. What if I can't pay my penalty all at once? Failure to follow the contract can result in late fees, possible suspension of your driver's license, and assignment to a collection agency. There will be a $10 charge for infraction time pay agreements.